This entry was posted in CFS/ME and tagged anaphylaxis, bedbound, bedridden, bowel swelling, brain fog, cromolyn, DEXA bone scan, disability, doctor, fatigue, GI issues, headache, headaches, IBS, M.E./C.F.S., mast cell activation syndrome, mast cells, MCAS, ME/CFS, muscles, myalgic encephalomyelitis, pain, period, rheuma, rheumatologist, sinuses, SSA, steps, symptoms, tongue swelling, yoga. So glad I stayed reading to the end! Apart from the ignorant comment now dealt with, it sounds like Dr O is on your side… imagine if he stomps out some of your nasty body grumpiness??? yaaaay.. everything crossed! Your post really “speaks” to me. I hope you can salvage your relationship with the doctor and the man apologizes! Next to the horrible physical suffering, the idea that I somehow want to be sick, unable to care for myself, and be on disability, making a fraction of what I did before. It kills me to have lost my career and ability to provide for my family. Oh, and being in the process of losing our home is an added fun bonus! It blows my mind to that any human would think one of us chooses to live like this. I sure as hell don’t, and I know you don’t. I’m glad you calmed down, but I’m still pissed on your behalf! Exactly! I’m probably not going to get disability and, even if I do, it’ll be years from now and a PITTANCE. Not enough to pay our mortgage, let alone other necessities. Thank you for being pissed off on my behalf. A little bit of outrage tends to fuel my fire to educate more people. It also causes me not to sleep and makes my symptoms worse– maybe I need to tell him that in case he thinks he’s doing excellent cattle-prodding of his patients! I am still pissed off, too. However, from what the therapist said about Dr O, I will retract my theory that he may like to use shock techniques (“mobilise anger”) as a test. He just blurts out but does get it – perhaps subconsciously?? Yep, sounds like he’s simply insensitive. I’d rather it be a calculated insult to illicit a response, honestly. I am still all ragey on your behalf – how could anyone think that! good luck with the MCAS – I’ll stay posted for updates! Thanks, Claire! It’s great to have the support. I’m still flabbergasted that he said that to someone as sick as I am. Wow. It’s interesting to realize that sometimes when doctors say things like that they really don’t know what they did! I know all too well how that feels. Great post. I am so sorry. I have been there, too many times. It’s awful. My heart goes out to you. I hate that you’ve been there many times, too! I don’t understand how this happens so often. As much as I read about the problems with doctors thinking ME is “all in the head”, I thought maybe that was with milder cases or something… ? But, honestly, I’d rather have him say it’s somehow caused by my brain than I am PURPOSELY doing this to get disability! So insulting! It’s absurd. Completely absurd. 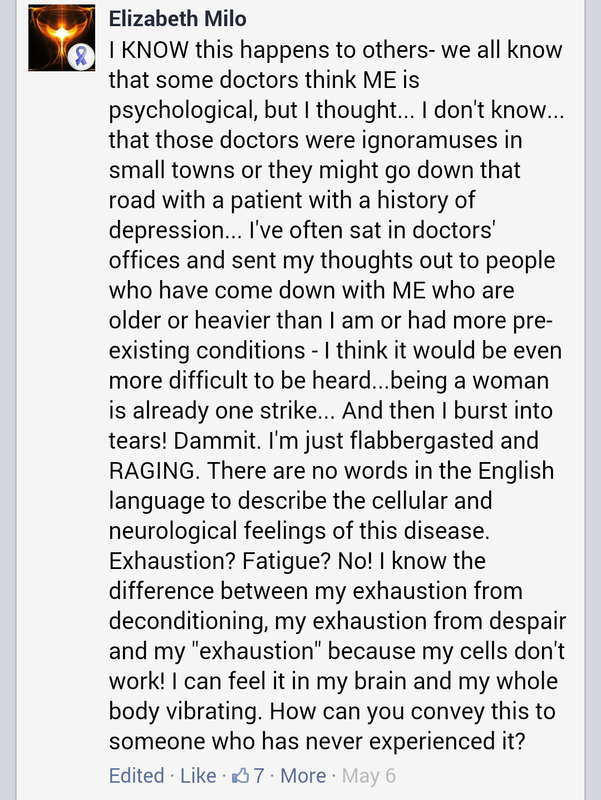 And a glaring statement on the lack of doctor education about this illness. I was told at my torturous lowest time that I made myself sick to have a “nice little break”. I was told that if I had children, I’d be motivated and would be better by now. I was told that I was imagining my crashes. Don’t even get me started. And some of these from doctors who seemed very normal up until those comments slipped out. The person who mentioned the children had spent the previous moments suggesting that I should probably see an infectious disease specialist. Where do those leaps come from?? Do they ask their cancer patients why they subconsciously didn’t want the chemo to work?? Anyway, again, I am SO sorry you encountered this. 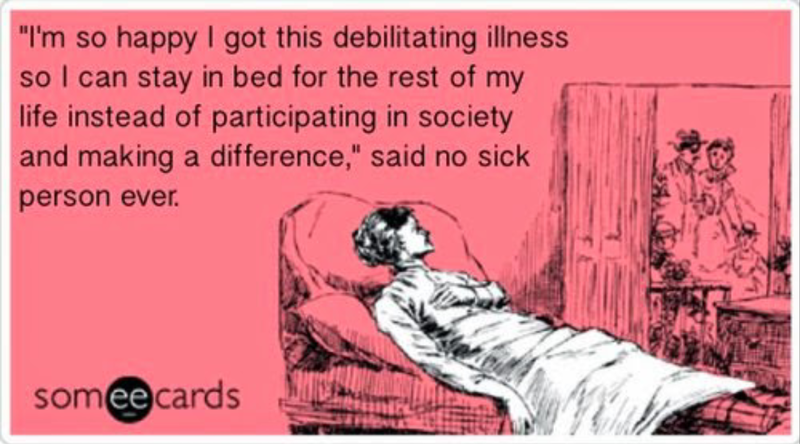 It’s a horrible slap in the face on top of the slap in the face that this illness naturally is already. Not only do you feel awful and have you lost so much of your life, but also instead of support and sympathy, you get ignorance and judgement and blame. I’m so very sorry. Hang in there. I’M JUST PLAIN SPEECHLESS–FOR ONCE! SO SORRY, THO! BIG HUG. BJ. Saying all that I’m actually jealous of your 90 min appt. Here we get an average of 7 mins with a Consultant, which we’ve waited an average of 4 months to see. I’ve never spent more than 15 mins with any doctor in my entire life. I was absolutely petrified to start my antihistamines, yet tolerate them both no problems (well, had a bit of an issue with Zantac but switched to Tagamet and all is good). 4 months on though and I still haven’t plucked up courage to try my Sodium C script 😉 Start off with a tiny dose and work up. I’m sorry this has happened to you so many times…. and I know you’ve heard similar things from some family members, too, which breaks my heart. You definitely make me feel better about our healthcare system, I must say. Over 90 minutes with this doctor, always 40 minutes with my GP and three hours at the intake with the naturopath! Reminds me of the time an allergist said to me I had “princess in the pea syndrome” – Im not allergic to anything just over sensitive. That was the beginning of this 15 year long journey into the depths of ignorant doctors. I felt so lucky that I was educated enough and self diagnosed when I came drown with ME 5 years ago and went straight to an ME/CFS specialist too but after 2 years he said I can’t help you further. You need to spend 3 months in the sun surrounded by friends and family feeding you good food. Thanks – is the insurance company going to pay for that? and goodbye. When I found a female doc 2 years ago who spent 3 hours analyzing my history (not so lucky about the $400 she charged and the weekly $600 treatments that followed) and turned to my husband and said “you’ll never understand what she’s going through as – it’s different for Moms” I cried with joy all the way home that Id finally found a doc who “got it” but then a few weeks later when I asked her should I get a wheelchair to get out as I was housebound, she said “do you want your kids to see you in a wheelchair?” and walked out. Who cares,my kids were overjoyed that I could come out to the park with them when I finally got one and Ciara rides on the back like its her chariot! No matter how much we think we’ve found a doctor who gets it, they don’t really unless they’ve had ME. More docs need to get ME not that I wish this evil disease on anyone. Aisling! Lovely to see you here. I was told I had “Princess and the Pea Syndrome” by my sleep doctor–his exact words! I want to spend three months in the sun being cooked for, too! I want to ask you if that was Dr. E. that was treating you, but don’t want to mention his name if you’re trying to maintain privacy.